What is the Kligman formula? Does it help fade dark spots? One of the most common cosmetic skin concerns is dark spots on the skin. Dark spots affect people of all ages, skin types, and tones and can remain long-term (and worsen over time) if not treated properly. 3. Acne: post-acne dark spots (post-inflammatory hyperpigmentation). What is the best way to treat dark spots? The dermatologist gold-standard formula for treating hyperpigmentation (caused by any of the above) is the Kligman formula, a prescription named after it's inventor, dermatologist Dr. Albert Kilgman. It was originally formulated in 1975 and has remained the most effective topical treatment formula for fading dark spots ever since. What is the Kligman formula? 1. Hydroquinone: a medical-grade skin lightening agent (~4-8%) reduces the activity of tyrosinase, an enzyme involved in the production of new melanin (i.e pigment). It is more effective than other brightening ingredients such as kojic acid, glycolic acid, and azelaic acid. 3. Hydrocortisone: a mild steroid (mometasone 1.0%) to reduce the side effects of skin irritation induced by the two other active ingredients. How effective is the Kligman formula? 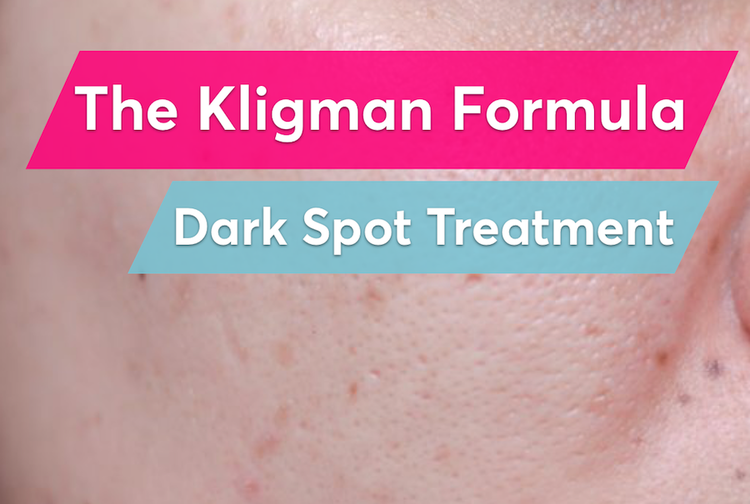 Kligman's formula is the most effective hyperpigmentation formula available. Combined with sunscreen it can help treatment of melasma, fade sun-induced dark spots (age spots), and is especially helpful with the treatment of post-acne dark spots. What are the disadvantages for the Kligman formula? 1. Hydroquinone percentage: The high percentage of hydroquinone (4-8%)used in the formulas prescribed by dermatologists, causes, in some rare cases of local paradoxical skin darkening (AKA ochronosis). This adverse effect is more frequent in people with dark skin types. 2. Prescription: Since the Kligman formula is that it is only available with a prescription, it requires a dermatologist office visits to obtain. That on top of the cost of the prescription from a pharmacy can put the prescription formula out of the price range for many. 3. Hydrocortisone: The weak link in the Kligman formula is hydrocortisone. Using topical steroids on the face for a long period of time can make the skin thinner, dilate skin capillaries, and lead to other skin conditions such as fungal acne and perioral dermatitis. Because of this, the Kligman formula should not be used for extended periods of time. Is there a prescription-free alternative to the Kligman formula? The MDacne Dark Spot Remover provides a prescription-free alternative to the costly Kligman Formula with some additional tweaks that give it some advantage over it's predecessor. The MDacne Dark Spot Remover combines the gold-standard Hydroquinone 2%, with active retinoids along with AHAs and BHAs to replace the original tretinoin, which can be highly irritating. The lower percentage of hydroquinone (2% as opposed to 4-8%) is highly effective while safer for all skin types and tones (including Asian and darker skin). Additionally, it replaces the hydrocortisone with plant-based complexes such as bearberry extract and vitamin c to both enhance the effect on inflammatory hyperpigmentation and provide power anti-inflammatory compounds. This new formulation is arguably as effective as the prescription versions with less irritation. Since it does not contain hydrocortisone, it is safe for daily application and long-term use (as needed). Plus, because it is available without a prescription, it is much more affordable. This new Dark Spot Corrector is best combined with an active, oil-free sunscreen, that both blocks UVB/UVA and protects the skin from sun-induced free radicals. This combination treatment will help fade existing dark spots and prevent new spots from forming. Kligman AM, Willis I. A new formula for depigmenting human skin. Arch Dermatol. 1975;111:40–8.